These tea cozies are made of home grown, hand spun wool yarn. Some embellishments are made with crochet cotton thread. About 10 inches high and 11 inches wide. 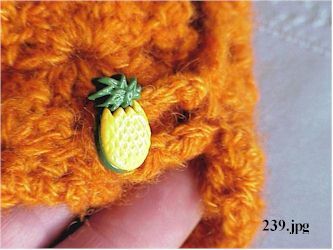 The tea pot cozie has a flap that allows easy dressing of your pot and a little pineapple button to hold it closed. 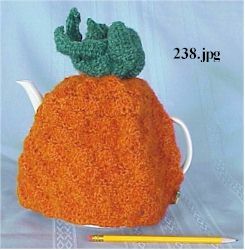 This tea cozy is about 9 inches wide by 8 inches tall. We will (gladly) accept checks, money orders, and bank checks, (all payable in U.S. Dollars) for all purchases. We will only accept "Paypal" to pay for purchases of less than $10.00. Click to Jump directly to..
Crochet Hats . 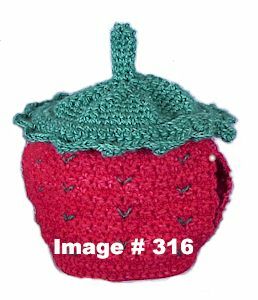 Tea-pot Cozies . Cross Stitch Pictures . "Zarah Jewelry" .. "Fiber Friends" Jewelry . Home . Sheep tales . Majacraft . Handcrafted Items . Fleece . Ball winders and Swifts . Table of Contents . Spindles . Jewelry . Farm Pictures .Links to others .